← Jeff Harnar: Does This Song Make Me Look Fat? I have seen ballet in many situations and forms, and was intrigued to see how the London Ballet Company would be able to utilise the tiny space that is the St James Studio. The mission of the company is fascinating. They specialise in bringing dance using classical technique to intimate venues, including full use of storyline rather than abstract concept. They perform at private and corporate events, as well as small theatres and employ international dancers from a variety of backgrounds. I have seen something similar with a handful of dancers, but this is a larger corp de ballet, requiring a greater degree of inventiveness to utilise every dancer in the ensemble pieces. Not many would be so brave. The show for St James was “00 and His 7” – a gentle parody of James Bond films, using film scores and songs about the character, with James Bond and seven glamorous female dancers. The dancers displayed strong technique and athleticism, and some showed good characterisation and story-telling skills. Amongst the most effective uses of physical theatre techniques were the simplest, such as a beautifully effective motorbike ride and the excellent masked villain, really projecting meaning and intention through the mask and trench coat. Other memorable moments were the well choreographed tango sequence and romantic pas de deux, bringing an air of vulnerability. Fran Mangiacasale guyed the role of James Bond well and danced expressively, especially in the drugged scene. In terms of performance skills, however, there were areas where I felt the dancers could develop. I would have liked to see a more languid, rippling upper body movement from some of them which would have helped portray a more sensuous, sexually dangerous attitude. This character portrayal is partly achieved through a more contemporary rather than classical approach, but more importantly through an internal intention and stronger focus. The storyline got slightly lost at times, and this too was partly due to lack of intention expressed by individual dancers in the ensemble, as well as a lack of clarity in the choreography in certain sections. Also, the early scene with masks would be even more effective with a stronger use of head and eyes, helping create a greater sense of breadth and communication with the gallery. There was a tendency to look down a little too much, and with masks especially, it is important to project outwards. The singer too could be put to greater use. Where the space is so intimate, even with classical singing, a greater connection with the audience, including some form of interaction would all help to welcome us in and involve us more in the piece. None of these qualifications are insurmountable, however, and as the dancers mature as artists and the company embraces their vision ever more strongly, we will I am sure see clearer and even braver work from this company. It was certainly an entertaining way to spend a lunch hour. All credit to St James Studio for their varied programme and experimental approach, nurturing developing companies, songwriters and artists. I look forward to seeing Stephen Luke Walker this Sunday evening. This entry was posted in Dance Reviews, Theatre Reviews and tagged 00 and his 7, 00 and his 7 review, ballet review, fiona jane weston, Fran Mangiacasale. 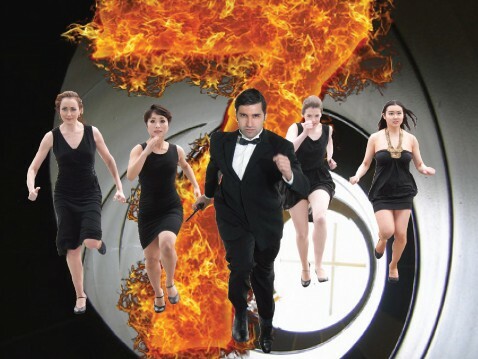 James Bond, London Ballet Company, lunchtime ballet, Lunchtime Theatre, St james Studio. Bookmark the permalink.